Making traditional nigiri sushi (finger sushi) is actually quite simple. Follow these steps to make your very own! This is necessary any time you will be working with sushi rice to enable you to handle it without it sticking to your hands and making the task of shaping impossible. Take enough rice to slightly fill the palm of your hand (perhaps the size of a very small egg) when it is closed. Form the rice into a thick rectangle with rounded edges approximately 2 inches long by 1 inch high and wide by pressing the sides. You may roll the rice around in your hand a bit but be careful not to press too hard as we do want to retain some of the air that has been incorporated into the rice into the final product. If you press too much it will be too dense and not have the right mouth feel. Once you have the ‘bed’ shaped it is your choice as to whether you want to place a dab of wasabi on it before the neta (fish). If you are not a fan of wasabi you may omit this step. You should have your fish, or whichever topping you choose, prepared for placement on the rice. Fish should be cut against the grain in a relatively thin slice just large enough to ever so slightly drape over the edges of the rice bed. Traditionally, the neta is 2 inches long, 3/4 of an inch wide, and 1/8 of an inch thick. Of course it is certainly your choice if you would like your neta to be giant, however the traditional itamae always strive for balance when preparing sushi, which usually results in being conservative with fish. But you are home and if you feel like it… go for it! Some restaurants have tried innovative cuts to make things interesting, but for the beginner, a simple rectangle of fish will suffice. Feel free to experiment as you become more comfortable. Once the fish is in place you will have made your first piece of nigiri sushi. Occasionally an itamae will wrap a thin piece of nori around the piece to finish it off (common with items such as scallops, for example). This is done by cutting a piece of nori in a strip approximately 1/2-3/4 of an inch wide and about 3-4 inches long (depending on how thick your nigiri sushi is). It is then wrapped around the center of the sushi item, closing on the bottom. It may not stick to itself right away and if not, just rub on it a little bit and the moisture from the rice should do the trick. Voila! Fancy sushi. You can use just about any topping that you can think of, so by no means restrict yourself to fish. Just remember to keep the neta small enough so that it can easily fit in your mouth without difficulty. While traditional nigiri sushi is eaten in one bit, no one will look down upon you if you make it two. While called ‘maki’ I thought to include this item in the nigiri sushi section as it does in fact closely resemble that style. There are some foods that are not easily placed on a bed of rice. Uni (sea urchin) and various types of roe, such as salmon roe (ikura) and tobiko. These items essentially need a ‘cup’ to contain the contents. This is accomplished by starting with the same type of rice bed that is used with traditional nigiri sushi, however not quite as long. However, once the bed is made, you will need a piece of nori that has been cut first in half, and then crosswise into strips that are approximately one inch wide. the nori is then wrapped around the rice to form a cup. The moisture from the rice should allow the nori to stick to itself and seal, if not, again, just give it a little rub. you then make sure the rice bed is flat and has enough room to hold your filling. anywhere from 1/2 to 3/4 of an inch should suffice, depending on your preference (I go for 3/4 personally, I love that uni!). This style of sushi allows for some interesting combinations. One of my all time favorite pieces, and I order it for my ‘dessert’ almost without exception is tobiko with a raw quail egg cracked over the top. It may sound odd, but the combination really works well. I often order two and have someone else at the table eat the other. Sometimes I make a convert, but a raw egg is not for everybody. My point is that it is good to experiment with what you feel comfortable. Be as crazy or conservative as you want, it is the making sushi at home bit that is the most exciting part. The natural enjoyment of your food will follow. 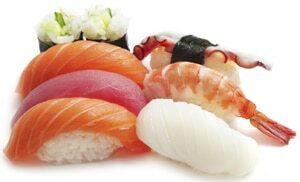 Looking for sushi grade fish and other seafood online?